Attached please find a letter and exhibits detailing an annual event that takes place in New York City, specifically, in certain locations in Brooklyn, that poses a substantial health risk. Despite being put on notice, local and state officials continue to ignore this dire and dangerous situation. That said, we turn to you, the CDC, on the federal level, for intervention and assistance. The event involves massive live animal slaughter in illegal makeshift slaughterhouses which takes place on public streets and sidewalks, with no regulation or safety precautions whatsoever. Attached herein as exhibits are a report and affidavit from a toxicologist, which sets forth his observations and conclusions as to the infectious and bacterial threats of this event, and the risks of a catastrophic epidemic associated therewith. Also attached as an exhibit is a list of local and state public health laws that are violated due to this event. Such violations are repeatedly unaddressed and ignored. Kindly read the attached documents, which have also been mailed to you in hard copy format via U.S. certified mail. Thank you for your time and attention, and I look forward to your response. I write regarding a grave concern in connection with an event that takes place in the Borough of Brooklyn, City of New York, on an annual basis, that poses an extraordinary public health threat, that is ignored by City and State officials. This event is known as Kaporos, and it is entirely overlooked by the local government that is entrusted to oversee the health protections of this city's citizens. Kaporos is an alleged religious event wherein chickens are slaughtered on public streets and sidewalks between Rosh Hashanah and Yom Kippur, annually. Kaporos will take place this year on or about between October 5 and October 11, 2016 in certain neighborhoods of Brooklyn, specifically, including but not limited to, Crown Heights, Borough Park, and Williamsburg. The slaughter involves over 50,000 chickens that are imported into said neighborhoods, unregulated. After an alleged religious ritual, the throats of said chickens are slit on public streets and sidewalks, and the chickens are bled out into orange cones provided by the NYPD. Kaporos subjects the public to bio-hazardous materials associated with and including but not limited to chicken blood, feces, urine, feathers and animal carcasses. The unsanitary, unmonitored, and unregulated slaughter of over 50,000 birds creates numerous and substantial health risks, by exposing residents and passers-by to said biohazardous materials and contaminants. Although Kaporos has taken place for over ten years without a known health epidemic occurring to date, this does not guarantee continued safety. The Kaporos event has grown exponentially with each passing year, and continues to grow and expand. Along with this expansion of the event goes the expansion of risk of health epidemics. The City has an obligation to stop this potentially catastrophic event, and protect the public from a potential public health catastrophe. Yet, it does nothing. Kaporos also involves illegal street and sidewalk closures and obstructions. There are inadequate methods in place to accommodate the level of unsanitary conditions that result from this practice, and it would be difficult, if not impossible, to accommodate these conditions even if regulations were to be put into effect, due to the uncontrolled nature of the event and its activities. Pedestrians, people on bicycles, people wheeling strollers, people in wheelchairs, and motor vehicles track through the ground and surfaces that are covered in and contaminated with blood, feces, urine, and feathers. Contaminants can become attached to the bottom of shoes and wheels and are then transported to other areas. The fact that Brooklyn is a borough in the country's largest metropolis that has major mass transportation systems in place such as subway, busses, and airports, increases the likelihood of the threat of a substantial, city-wide, and even nation-wide or world-wide outbreak of the illnesses described herein. The open-air construct of the makeshift slaughterhouses and the activities of Kaporos also permit airborne transmission of contaminants due to weather (e.g., wind, air currents) well outside the immediate area of the Kaporos event. Thus, the Kaporos activities constitute a dangerous condition and thereby pose a significant public health hazard that could be catastrophic. Laws, rules, and regulations were enacted specifically to prevent an outbreak of illness and health hazards. Because Kaporos occurs in flagrant violation of all of these laws, it presents an imminent health risk not only to those participating in the ritual, but to innocent passers-by, residents of the area, shoppers, merchants, patrons, and, with the likely threat of an epidemic, the public at large. On its website, the Centers for Disease Control and Prevention specifically addresses many of the health threats caused and created by Kaporos. The CDC clearly recognizes the risks involved in allowing illegal makeshift poultry slaughterhouses to exist in residential neighborhoods. That said, we seek federal intervention to protect the public from this annual threat that local government ignores. Poultry is a source of infectious disease for humans. Much of the public health concern with respect to contamination of poultry meat is in the context of food-borne illnesses, which in and of itself raises questions and concerns regarding the ritual of Kaporos and the alleged practice of donating the slaughtered chickens as food for the poor. However, photographic and video evidence, as well as sworn testimony submitted in a related lawsuit1, shows that the birds are not in fact donated for food, but rather, are stuffed in large garbage bags and left for the New York City Sanitation Department to haul away to some unknown location. Moreover, even if in fact these slaughtered birds are donated for food, that opens up another door to a myriad of additional laws, rules, and regulations that are violated, as food items, especially poultry, require inspection on both the state and federal level. Because of the reckless manner in how the birds are confined, handled, killed, and left on the street, it is a safe assumption that these birds would never pass a federal or state safe food inspection. The public health concerns with respect to chickens as vectors for disease transmission are not limited to food borne illnesses. Salmonella and Campylobacter species of bacteria are the most important agents numerically; however avian viruses including certain strains of influenza2 and other bacterial pathogens such as Archobacter3, Chlamydophila4 and Eschericia5 that are found in poultry are important human pathogens. Campylobacter, mainly Campylobacter jejuni and C. coli, are recognized worldwide as a major cause of bacterial food-borne gastroenteritis. Epidemiological studies have shown the handling or eating of poultry to be significant risk factors for human infections. Campylobacter contamination can occur at all stages of a poultry meat production cycle. The most common symptoms of campylobacter-induced gastroenteritis include diarrhea, abdominal pain, fever, headache, nausea and vomiting. Symptoms usually start 2–5 days after infection, and last for 3–6 days. Severe complications, such as the debilitating autoimmune disease Guillain-Barré syndrome (GBS), may follow campylobacter infection as campylobacter infection has been established as a risk factor for GBS6. Kaporos puts the public at risk for these illnesses and symptoms. The chaotic unrestricted access of the Kaporos event is a marked contrast to the biosecurity protocols that are implemented at sound poultry facilities that are aimed at protecting the health of the animals as well as the people coming in contact with them. It is recognized within the poultry industry that there are bio-hazards associated with handling and processing live birds7. Such a biohazard is unnecessarily being brought upon the residents of Brooklyn, and likely beyond, during the Kaporos events. N.Y.C. Health Code section 153.09 states that it is illegal to put any blood, offensive animal matter, dead animals, or stinking animal matter into a public street, place or sewer. Laws like these were enacted to protect the public from harm. Violations of same are a public health threat. Kaporos violates this statute. N.Y.C. Health Code section 153.21(a) states that it is illegal to pile up dead animals on the street prior to their disposal, another law set in place to protect the public. This protection is breached by Kaporos. N.Y.C. Health Code section 161.19(b) states, "Sellers of live poultry must keep the areas of slaughter and the surrounding areas clean and free of animal nuisances". This statute is also breached by the Kaporos events, again, creating significant and imminent health risks. There is a stark contrast of precautions taken at sound poultry facilities, compared with the utter lack of precautions at Kaporos, and the resulting health threats therein. NY AG & Mkts Law Article 96 Section 5-A and 5-B prohibits the slaughtering of animals near residential neighborhoods, inter alia. Section 96-B makes obtaining a license to slaughter animals a requirement. No license is obtained, or even applied for, by the Kaporos practitioners. NYC Administrative Code Section 18-112(d) states: It shall be unlawful to erect, establish or carry on, in any manner whatever, upon any lot fronting upon [locations involving the subject locations], any slaughter- house . . . or any other manufactory, trade, business or calling, which may be in anywise dangerous, obnoxious or offensive to the neighboring inhabitants. The term “slaughterhouse” is not limited to a building with walls; it includes the activity of carrying on the slaughter of animals “in any matter whatever.” This statute is violated. A complete list of the fifteen known city and state laws, rules, and regulations that are violated is annexed hereto as Exhibit 1. There may be federal law violations, as well. An affidavit dated May 22, 2015 from Michael J. McCabe, Jr., Ph.D., DABT, ATS, an expert on matters involving the investigation of issues involving toxicology, microbiology, and immunology, and human disease causation, is attached as Exhibit 2. Dr. McCabe is an internationally-trained and nationally-recognized scientist, board certified in toxicology as a Diplomate of the American Board of Toxicology and as a Fellow of the Academy of Toxicological Sciences, and an active member of the Society of Toxicology. He has served on numerous national and international advisory committees for the National Institutes of Health (NIH), the National Academy of Sciences, the US Environmental Protection Agency, the Department of Defense and the World Health Organization. In addition to Dr. McCabe's affidavit, which was crafted prior to the Kaporos event of 2015, also attached as Exhibit 3 is a supplemental report dated January 17, 2016, by Dr. McCabe. The supplemental report was crafted following the Kaporos event of 2015, after which Dr. McCabe personally visited relevant locations and collected samples from public streets, sidewalks, and similar areas. Dr. McCabe's findings should not be taken lightly. They reflect an opinion of a competent scientist regarding a serious public health risk. On September 17, 2015, the undersigned wrote a similar letter to this one, to the New York City Comptroller, Corporation Counsel, the Commissioner of the New York City Department of Health and Mental Hygiene, the Commissioner of the NYPD, and the New York State Agriculture and Markets Agency, about this situation. All the letters were ignored. The City and State continue to fail to enforce these requirements, laws, rules, and/or regulations, despite awareness of all of the substantial and serious health and other risks that come with Kaporos. We ask the Federal government to intervene and investigate this issue immediately. It is imperative that this matter is given immediate attention, in light of the upcoming Kaporos event scheduled to take place on or about October 5, 2016. 2 Wan, X.F., Dong, L., Lan, Y., Long, L.P. et al. Indications that live poultry markets are a major source of human H5N1 influenza virus infection in China. J. Virol. 85:13432-13438, 2011. 3 Ho, H.T.K., Lipman, L.J.A., Gaastra, W. The introduction of Arcobacter spp. In poultry slaughterhouses. Int. J. Food. Microbiol. 125:223-229, 2008. 4 Dickx, V., Geens, T. Deschuyffeleer, T., Tyberghien, L. et al. Chlamydophila psittaci zoonotic risk assessment in a chicken and turkey slaughterhouse. J. Clin. Microbiol. 48:3244-3250, 2010. 5 Mbata, T. I. Poultry Meat Pathogens and its Control. Internet. J. Food Safety 7:20-28, 2004. 6 See affidavit of Dr. Michael J. McCabe, attached. 7 Sams, Alan R., Editor. Poultry Meat Processing, CRC Press, New York, p. 142, 2001. 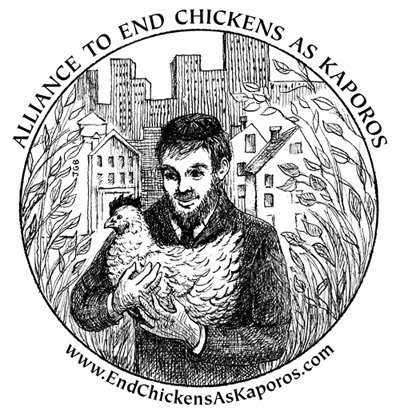 The preceeding letter to the Center for Disease Control from The Alliance to End Chickens as Kaporos is available in PDF format.